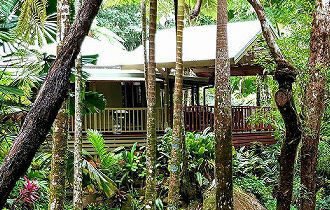 Daintree Secrets Rainforest Sanctuary is a stunning scenic 2 hour drive north of Cairns. You will need to hire a car from Cairns airport. You do not need a 4 wheel drive, any small car would be suitable. Once you leave the airport, you will turn right onto the Captain Cook Highway and drive north along this road for approximately one and a half hours. The drive takes you past fields of sugar cane and over cane tram lines. The road hugs the coastline for many kilometres with beautiful views of the Coral Sea. On your left, you have the majestic mountains of the Atherton Tablelands. 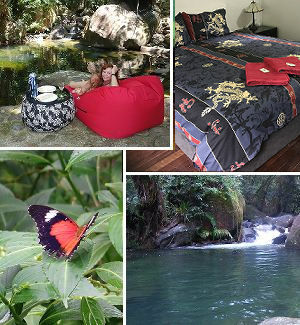 If you have plenty of time, you may decide to turn off and explore Port Douglas on your way. 10 minutes north of the Port Douglas turn-off, you will pass through Mossman. This is your best opportunity to buy supplies, There is a large Woolworths and other convenience stores. Leaving Mossman you will veer to the left under the magnificent Raintrees. Here the Captain Cook Highway turns into the Mossman-Daintree Road. You will follow this for a further 20 minutes until you come to a 'T' intersection with a road to your right sign-posted "Daintree Ferry". Take this right turn and drive to the ferry terminal. The Daintree Ferry runs continuously every day of the year from 6am to midnight. This scenic trip takes only 10 minutes. You simply drive your car on and stay in the car for the short journey enjoying the incredible views and drive your car off. Now you are in the rainforest. The drive takes you up over Alexandra Range with it's scenic lookout over the Daintree River mouth, Low Isles and Cape Kimberley. This is the best mobile range you will have access to whilst in the Daintree. Continue past the lookout through the beautiful rainforest with spectacular views and waterfalls along the tree-fern lined road. After approximately 20 minutes you will pass the Daintree Rainforest Village shop, continue for another 5 minutes or so past Lync Haven resort and Cafe and you will see sign posts for Heritage Lodge. You will come to a large sign for the Butterfly and Bug Museum, take this left turn into Turpentine Road.